Released on: May 15th, 2018. Directed by W.D. 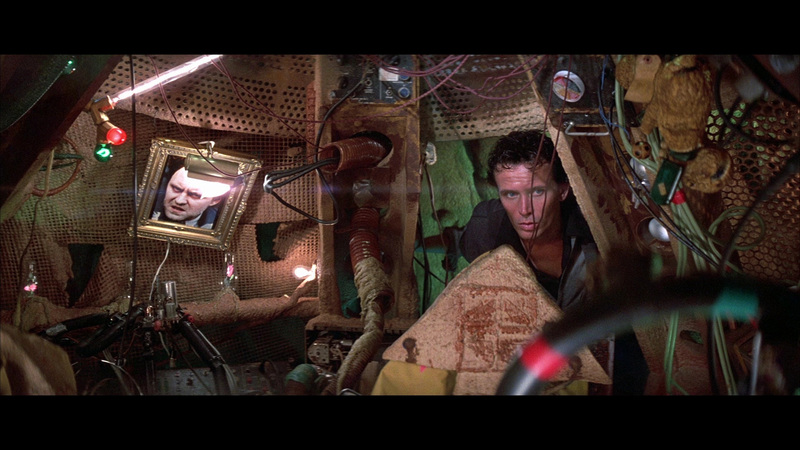 Richter, The Adventures Of Buckaroo Banzai Across The 8th Dimension was a notorious box office flop when it first hit theater screens in 1984 (this reviewer saw it first run with his father and sister in an otherwise completely empty theater!) but it has gone on to achieve considerable cult status over the years. This didn’t stop production house Sherwood Studios from crashing and burning along with the picture, but the film’s popularity has definitely grown since then. Shout! Factory has opted to launch their new Shout! 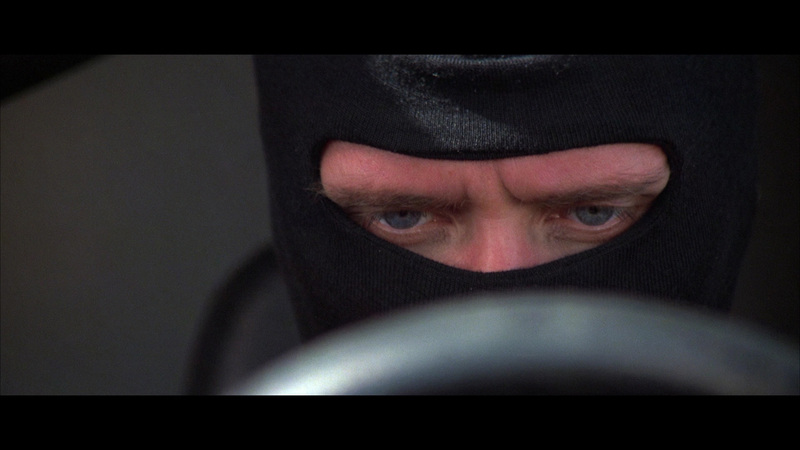 Select line with a two-disc special edition release, bringing the film to Blu-ray for the first time in North America. 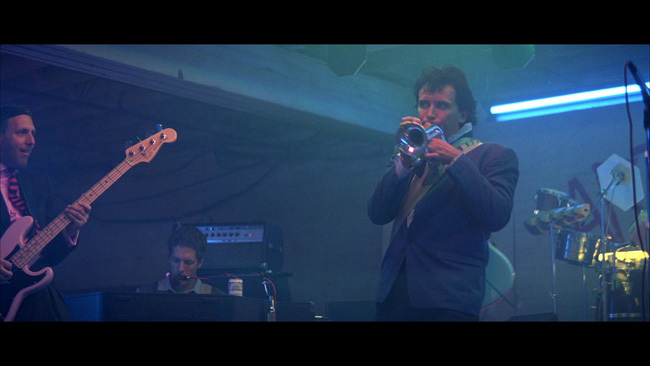 The story, which is a completely bizarre cocktail of different genre elements, introduces us to the titular Buckaroo Banzai (Peter Weller), a world renowned adventurer, physicist, neurosurgeon, scientist and rock star. He leads his troop of fellow scientist/rock star types, The Hong Kong Cavaliers, on various adventures. When the story begins, Buckaroo, with some help from friend and fellow scientist Professor Hikito (Robert Ito), is preparing to test out his latest invention. The newly created Oscillation Overthruster will allow him to seemingly drive his jet-car through a mountain. What he’s really done, however, is briefly travel into the eighth dimension. Later that night, he and the band perform live at a night club where Bucakroo takes an interest in a beautiful (but clearly very sad) young woman named Penny Priddy (Ellen Barkin). 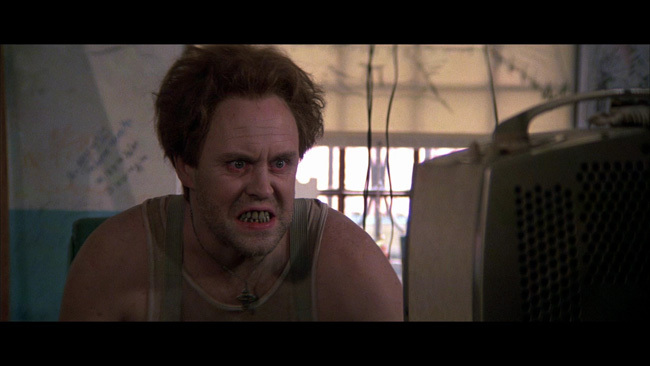 Meanwhile, the nefarious Dr. Emilio Lizardo (John Lithgow) escapes from a mental hospital, killing a guard (Breaking Bad’s Jonathan Banks!) 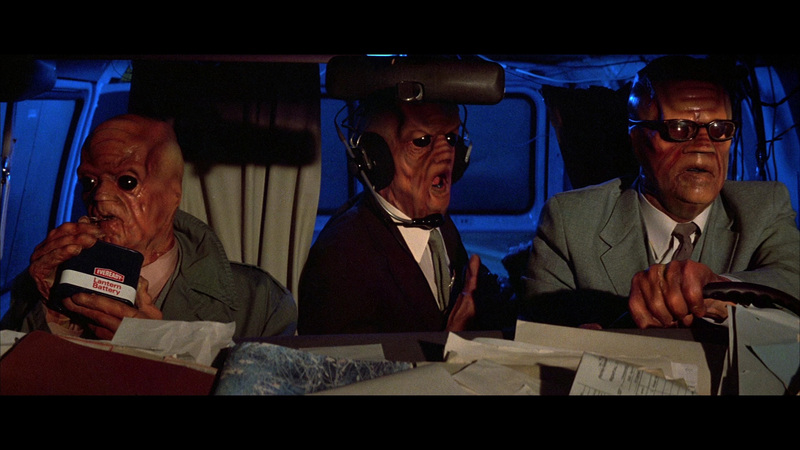 and alerting some aliens – the Red Lectroids (Christopher Lloyd, Dan Hedaya, Vincent Schiavelli) - of both his escape and his intention to complete the unfinished experiments he had to abandon after going insane fifty years ago. The Red Lectroids are trapped on Earth and need the device to get back to their own dimension. See, the Red Lectroids got into a war with the Black Lectroids and after losing that fight, were banished into the eight dimension. When Lizardo temporarily entered it in 1938, he allowed Red Lectroid leader Lord John Whorfin to take control of his body. 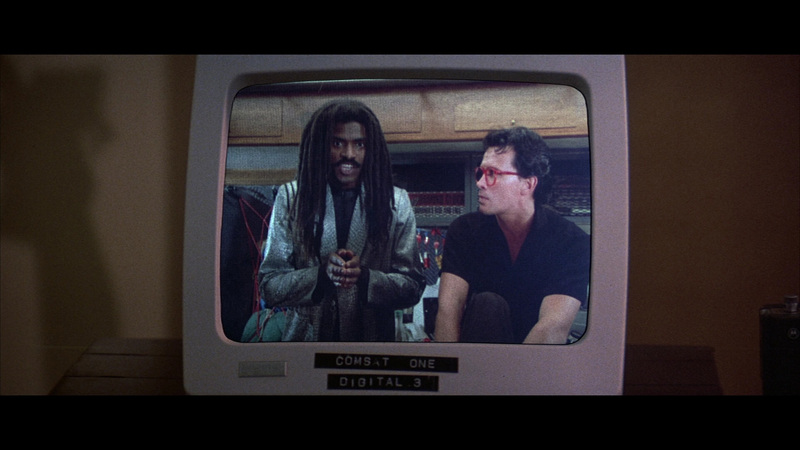 Eventually a Black Lectroid named John Emdall (Rosalind Cash) shows up to warn Bucakaroo about what’s really happening. It seems that Whorfin intends to steal the Overthruster to power a giant spaceship they’ve been secretly building in hopes of using it to get back to their home world. If the Red Lectroids cannot be stopped, there will inevitably a nuclear war. 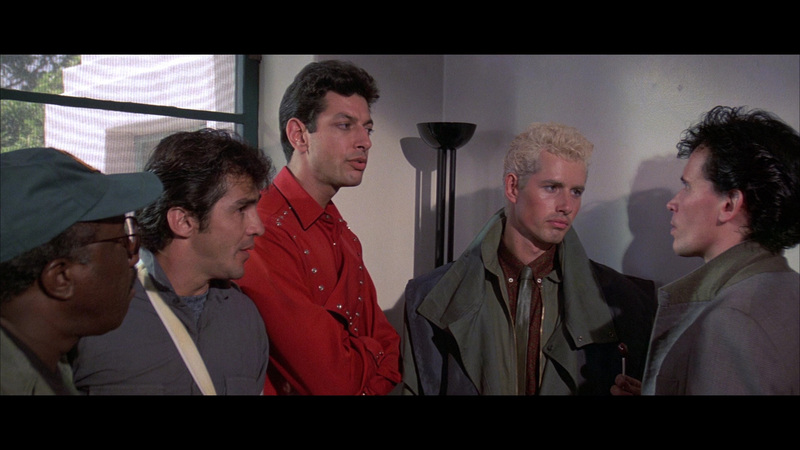 So with the fate of the world hanging in the balance, Buckaroo and his team – New Jersey (Jeff Goldblum), Perfect Tommy (Lewis Smith), Reno Nevada (Pepe Serna), Pinky Carruthers (Billy Vera) and Rawhide (Clancy Brown) – hop into their tour bus and set out to save the world. Or something like that. It’s best not to think about this one too much, it really ruins the fun. The Adventures Of Buckaroo Banzai Across The 8th Dimension is an hour and forty minutes of complete and utter nonsense, but it sure is a blast to watch. First and foremost, there’s the cast. Peter Weller is great here, playing deadpan the way he does it best – Buckaroo is calm, cool and collected at all times, and while the very existence of a character such as he is completely far-fetched, he sells it. 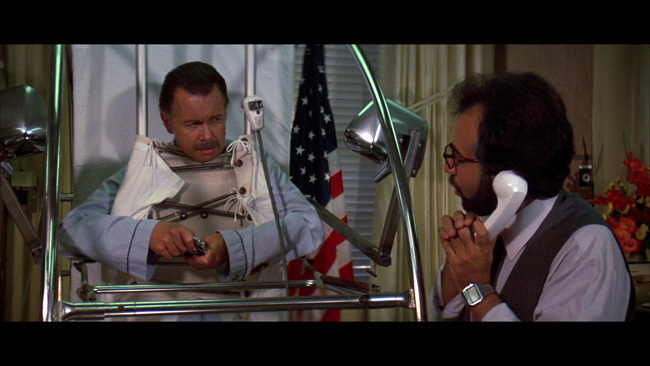 Surrounding him with the likes of the great Jeff Goldblum, a tough guy like Clancy Brown and other recognizables like Lewis Smith, Pepe Serna and Billy Vera was a wise move. Ellen Barkin plays the damsel in distress very well here – and she’s gorgeous too. But the bad guys? They kind of rule. Christopher Lloyd plays crazy in the best way that Christopher Lloyd can play crazy, while Dan Hedaya and Vincent Schiavelli are just as good, if not quite as over the top. 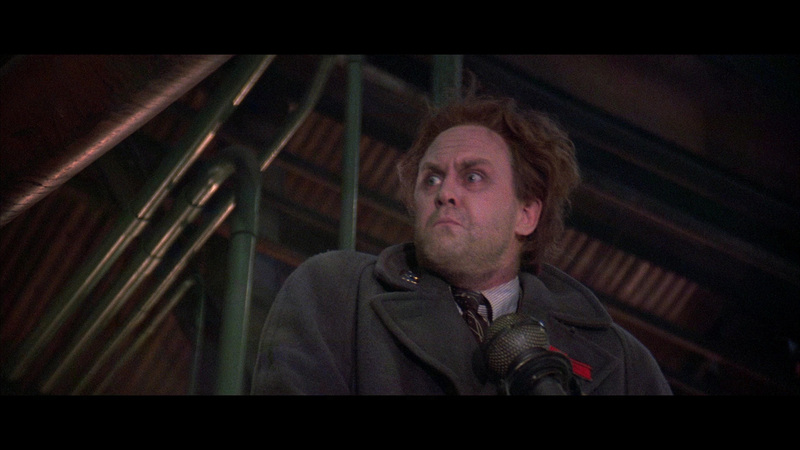 And then there’s John Lithgow. As Lizardo he’s got the world’s worst Italian accent, but he’s so completely committed to the part that somehow it seems entirely right. He’s in full on lunatic mode here, never slowing down and never giving less than one hundred percent. If the movie were nothing more than Lithgow running around saying strange things at inopportune times it would still be awesome. 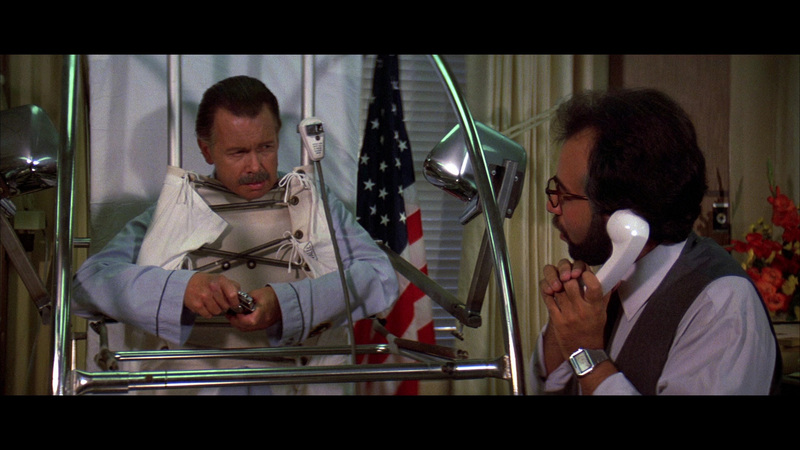 Oh and Yakov Smirnoff appears here in a small role as a security advisor. 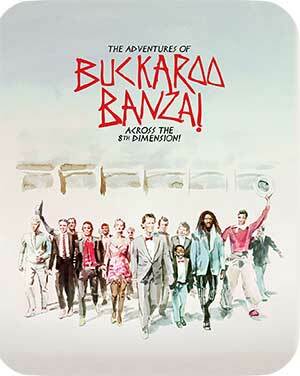 Buckaroo Banzai arrives on Blu-ray from Shout! 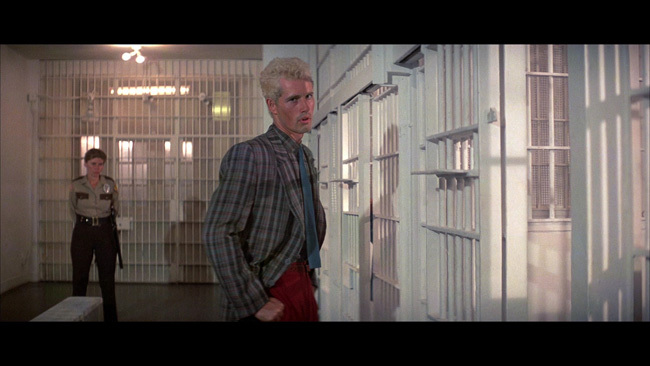 Factory in an AVC encoded 1080p high definition transfer framed in the film’s proper 2.35.1 aspect ratio and it looks great. Detail is impressive throughout, so much so that you’ll have no trouble seeing that some of the appliances applied to the alien characters are clearly made of foam! Skin tones look nice and natural and color reproduction looks great, never too hot or too cold. Black levels are nice and inky, very solid with no crush, and the disc is free of any obvious compression issues. Eagle-eyed viewers might spot the odd white speck here and there but you really have to be looking for it to even notice it in the first place, the image is otherwise pristine. Noise reduction and edge enhancement don’t factor into things here at all, and really, the picture quality here is very strong and the film looks gorgeous. Note that this appears to mirror the transfer used on the two disc set that was released a few years ago. English language audio tracks are provided in DTS-HD 5.1 and DTS-HD 2.0 stereo track with optional subtitles provided in English only. Purists will opt for the stereo track and it sounds great, while those who dig remixes can enjoy the 5.1 mix, which not surprisingly spreads things out a bit more. Both tracks are nicely balanced and feature crisp, clean dialogue. There are no problems with any hiss or distortion and the score sounds great, as do the effects. The extras are spread across the two discs in this set and again are duplicated from the previous special edition Blu-ray release. One the first disc, which is a Blu-ray, we start off with a brand new audio commentary from Michael and Denise Okuda. Although they were not involved in the film, they’ve gone on to do production work on plenty of features and are quite obviously fans of the film. Their talk allows them not only to voice their appreciation of the film’s creativity and originality but also share some input as to the design aspects that stand out, the effects work, the bizarre visuals that run rampant through the movie, the characters and quite a lot more. Their enthusiasm for the material is obvious and infectious and their observations genuinely interesting. 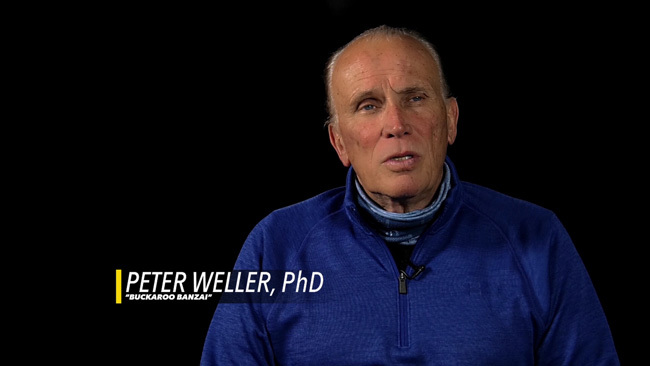 The disc also includes a second commentary, this time with director W.D. Richter and writer Earl Mac Rauch that is carried over from the original DVD release. For those who haven’t heard it, the track is a pretty detailed look at the origins of the film, starting with where a lot of the ideas for the movie and characters came from. They also talk about how humor was used throughout the picture, casting the film, what it was like working with the different actors in the picture, the effects work and a fair bit more. By far the biggest extra on the disc, however, is the one hundred and twenty-eight minute long documentary, Into The 8th Dimension which is made up of brand new interviews with many of the cast and crew members involved in the film. You can watch this by selecting one of the individual parts of the documentary (The Origin / The Cast / Making The Movie / Design Elements / Visual Effects / Post Production, The Release / Beyond Banzai) or all in one lump sum. As far as who shows up here? Well, it’s a long list but appearing on camera to discuss various aspects of the production are director Richter, producer Neil Canton, makeup artists Bari Dreiband-Burman and Tom Burman, effects supervisors Peter Kuran and Michael Fink, composer Michael Boddicker, set decorator Linda DeScenna, costume supervisor Eddie Marks, costume designer Aggie Rodgers, motion control tech Hoyt Yeatman and co-editor Richard Marks. And of course, most of the principal cast members show up here too - Clancy Brown Carl Lumbly, Peter Weller, Pepe Serna, John Lithgow, Christopher Lloyd, Billy Vera, Lewis Smith, Damon Hines and Gerald Peterson. As you’d guess with a running time as long as this documentary has, it’s a pretty damn thorough look at the making of the movie. The interviews give you the impression that this was sometimes a fairly tough shoot, what with the producers and the studio meddling as they did, but at the same time, there’s a definite ‘labor of love’ vibe here too. If you want to know what went into the costume design, the alien and makeup effects work and just as importantly scoring the film, you’re covered here (the use of music in this movie really doesn’t get the credit that it deserves) while the cast members offer up plenty of insight into their feelings on their characters and their experiences on set. This does a really great job of covering pretty much all the bases – the technical side of things is explained, some of the weird humor and in-jokes in the movie get talked about and the legacy and enduring cult popularity of the film also explored. The second disc, which is a DVD (given that these supplements were originally created in standard definition this makes perfect sense), features some supplements that will definitely look familiar to those who have owned past versions of this movie starting with the Buckaroo Banzai Declassified featurette. 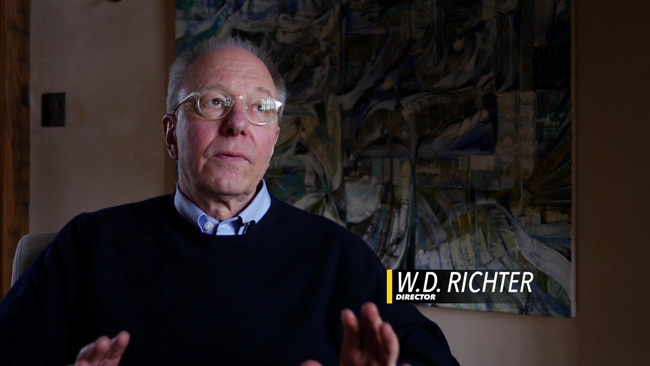 This twenty-three minute piece originally appeared on the old MGM DVD and it features interviews with Richter, Weller, Lithgow, Barkin, Smith and a few others. It’s a reasonably concise look at how the movie came together and who did what, but once you sit through the featurette on the main disc, you’re not likely going to learn too much from this one. Menus and chapter selection are also included on the first disc. More interesting are the alternate opening scene (with Jamie Lee Curtis as Buckaroo’s mother!) and the fifteen minutes of deleted scenes. Again, these popped up on the older DVD release but it’s obviously important that they be included on this Blu-ray special edition as well. Rounding out the extra are the Jet Car trailer that was made in the nineties in hopes of creating interest in a television series based on the property, the film’s original theatrical trailer and some menus. Completists take note, however, that a few of the minor extras from the MGM DVD are not ported over here (Pinky Carruther’s Unknown Facts, the Terry Erdmann interview, the still galleries and the Banzai Institute Archives) and a few extras from Arrow’s UK Blu-ray release remain exclusive to that release (the closing sequence, Matt Zoller Seitz’s visual essay, the Lincoln Center Q&A panel, the Lord John interview with Lithgow and Tao Of Buckaroo interview with Weller). What separates this new reissue from the previous one is the packaging, which is a nicely made steelbook limited to 10,000 copies. 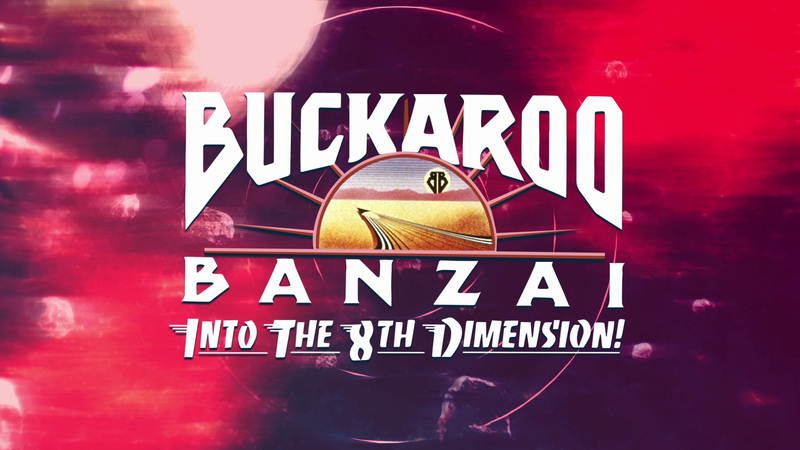 The Adventures Of Buckaroo Banzai Across The 8th Dimension is just as much fun now as it was back in 1984 when it bombed in theaters! The film is an hour and forty-minutes of non-stop entertainment, played with tongue firmly in cheek but also with a really free-spirited sense of wild creativity. Shout! Factory has launched their new Shout! Select line with this two-disc special edition and it’s a fantastic release. The audio and video presentation is top notch and the extras are plentiful and more importantly, really well done. Those who own the previous special edition will have to decide how much a steelbook packaged option means to them as the contents of the two discs are the same, but if you don’t already have that version and want to own the film? This is a great way to do it.